Since 1988 Kerstin Thomas and Bernard Langer have been recovering some of the houses in the village of Cerdeira. Later in 2000, Natália and José Serra, friends they had met in Coimbra, joined in the recovery effort. Gradually, the project gained form and meaning. In 2006 was organised the first Arts festival "Elementos à Solta". 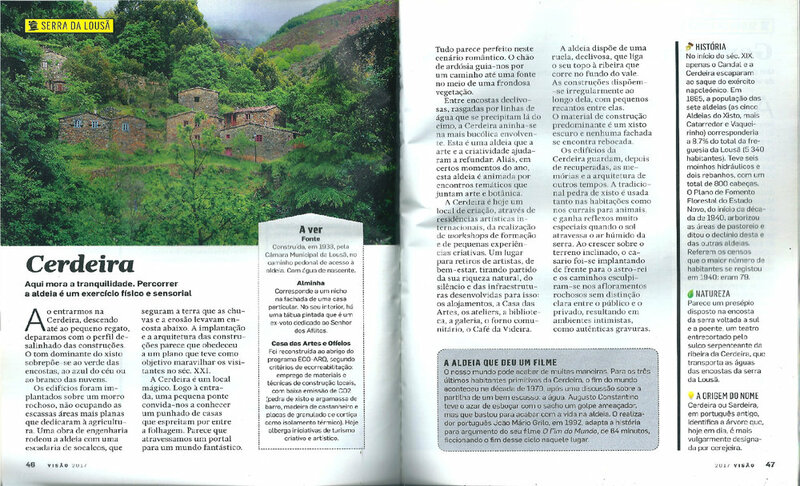 In 2012, the Cerdeira Village project started, which in 2018 became Cerdeira - Home for Creativity. If you are a media professional, you will find here what you need to not resist making a visit. The Cerdeira - Home for Creativity in the press. Awards and other distinctions received by Cerdeira - Home for Creativity. Assigned to Cerdeira by TripAdvisor in 2018. Assigned to Cerdeira by Airbnb for the 7th consecutive year. Assigned to Cerdeira by Booking.com. 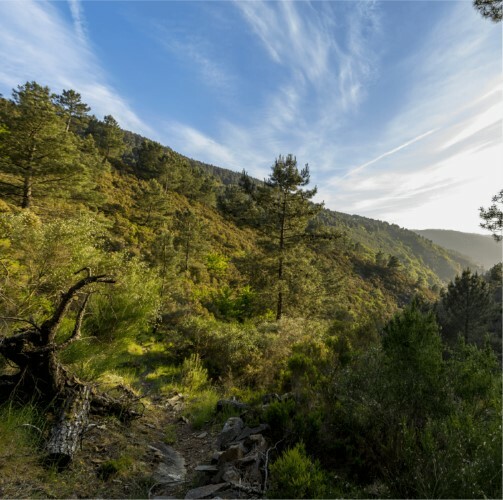 For its natural environment in a Natura 2000 area, the isolation and beauty of its architectural heritage, Cerdeira intends to offer its visitors a creative experience, enriching and unforgettable. Cerdeira - Home for Creativity was thought to a sustainable and inspiring project. Our schist houses have been rebuilt with stone, clay and native woods, always thinking about the comfort and well-being of our guests. Use Culture and Art as a means of connecting with the Local Community. The Ecolabel EU is a European label that applies to products with exceptional environmental characteristics that meet the criteria required by EU Ecolabel regulation. Tourism is one of the activities with the highest growth rates worldwide. More and more people are planning to visit more places, whether at work or on vacation. In this context, it is increasingly important to encourage the various stakeholders in tourism to adopt good environmental practices, reduce the negative impacts of tourism and the costs of consuming natural resources. It is from these assumptions that the Green Key program and its demanding criteria arise, as an important instrument for Sustainable Tourism. The criteria for tourism enterprises and local accommodation have been recognized by the Global Sustainable Tourism Council (GSTC). 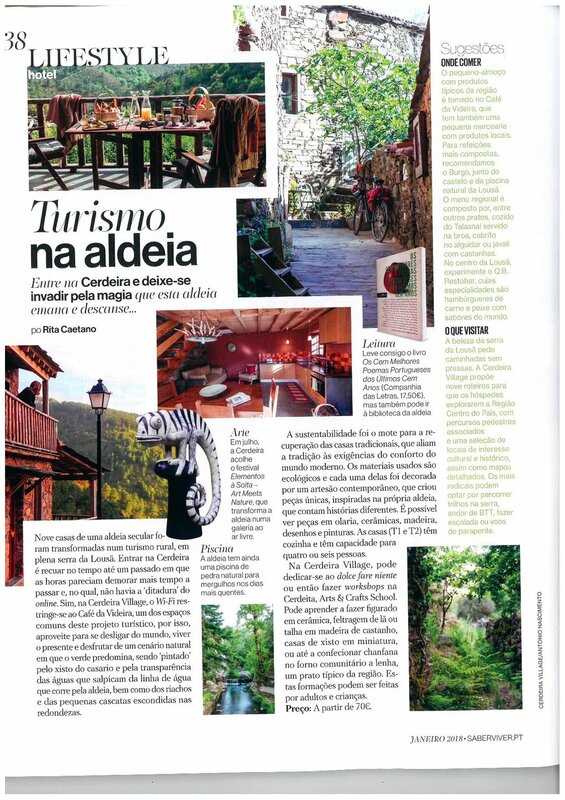 A Cerdeira is located in Central Portugal, less than an hour away from Coimbra, 9km away from Lousã. Coimbra – Cerdeira: 37 km. Follow the A1 until Torres Novas and then take the A23 towards Castelo Branco. Follow the directions towards the A13 (Tomar and Coimbra) and stay on the A13 until you see an exit marked Miranda do Corvo/Lousã (N342). When you arrive in the center of Lousã, by the City Hall and the town’s main church, follow the directions towards Cerdeira (N236). You will find the village in about 9km. When you arrive, park at the square by the chapel. Take the A1 until Condeixa and then take the A13 (Tomar and Lousã). Stay on the A13 until you see an exit marked Miranda do Corvo/Lousã (N342). When you arrive in the centre of Lousã, by the City Hall and the town’s main church, follow the directions towards Cerdeira (N236). You will find the village after about 9km. When you arrive, park in the square by the chapel. Take the train or bus to Coimbra. In Coimbra, at the Coimbra-A train station, take the bus called “Metro Mondego” headed towards Lousã. In Lousã, take a taxi to the village, which is about 9 km away. The ride should cost you about 13€ and can be booked by calling +351 917 866 975.